How do I take full advantage of Infinity Display on my Galaxy S8? 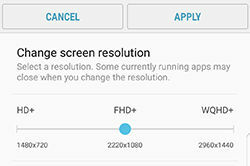 You can customize the resolution and color scheme of your display. The new Edge Screen feature lets you easily open your most frequently used apps and keep in touch with your closest contacts. Note: All active apps will be closed when you change the resolution. 5. Touch the desired screen mode. 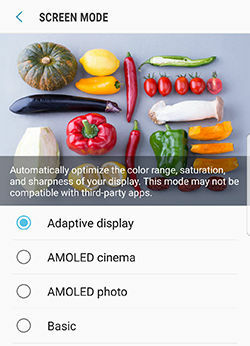 Note: Adaptive display automatically optimizes the display to match the image being displayed and other criteria, such as the current battery level. 4. Navigate to and touch Edge screen. 5. 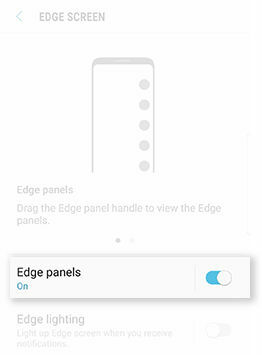 To enable Edge screen, touch the slider next to Edge panels. 6. 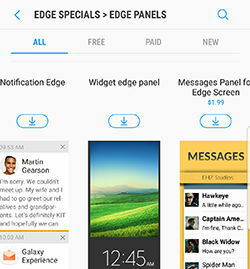 To customize your Edge screen, touch Edge panels. 7. Swipe to the left to view the available panels. To enable a panel, touch the circle above the desired panel. 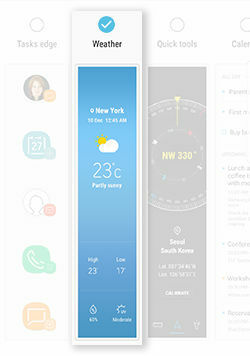 For this example, touch Weather. 8. To use the Edge screen, swipe to the left from the right edge of the screen. 9. Swipe to the left or right to scroll through the available panels. 6. Touch DOWNLOAD at the top of the screen. 7. 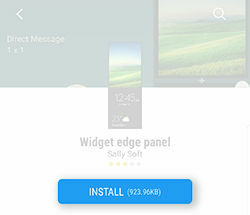 Swipe left to view the available edge panels and then select the panel you want to download.